The much-anticipated KidsfestTO, happening at the International Centre, Family Day Long Weekend 2019 is back and is gearing up to provide laughter, fun and play for kids 12 and under. Kids Fest Toronto has more than thirty themed inflatables that are blown-up and ready for action. That’s 80,000 square feet of pure fun. Children can slide, ride and bounce all day. Inflatables range from large slides to toddler appropriate rides. On top of the fabulous inflatables, KidsfestTO offers, shows, interactive activities, games, crafts and more. 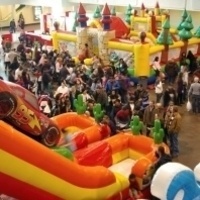 Come be a part of North America’s largest indoor inflatables and bouncers.